This software allows the user to monitor all activities that take place within the computer. It is a freeware and has the capability of taking screenshots of applications that are running at certain intervals; it also gives a periodic report of all programmes that are running on the computer. 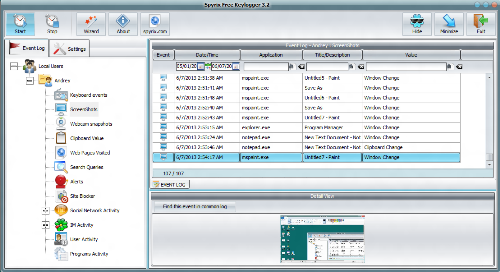 Spyrix Free Keylogger is a good spying software. Some people consider it immoral to spy on the activities that are running on another pc. This is quite true when the purpose of spying is to steal identity or other sensitive information. The situation is different when one has children. Spying can be an important part of a parents’ life in order to keep track of what the child does in the internet. Using internet is like opening the door to a stranger. A child can meet a lot of people in different social networks, hold conversations that might expose the child to sexual predators and other risk. There is a so much risk open in the internet and parents cannot help but wonder what can be done to protect their children in the internet. Legality of Keyloggers This freeware is legal and needs administrative privileges on the computer. The freeware is not prohibited and can be installed on any computer. Installing keylogger is like installing other common software or game on a computer – all that is required are administrative rights in the system where it will be installed in. Keyloggers and monitoring Most monitoring freeware are unethical. It is an invasion of privacy to install spying software on another person’s computer. However, it is legal for parents and employers to monitor the activities of their children or employees. This freeware will avail the parent the opportunity of knowing what exactly their children are doing online. The beauty of the keylogger is that the parent monitors the activities that take place on the PC undetected. It is also legal for employers to monitor the activities of their employees. This though might not be pleasing to the employee, but the employer has this right. The employees are sometimes informed that their activities are monitored but in most cases they are not inform. At present the courts are on the side of the employer, so he has right to install the keylogger on all computers at the work place.